Sussex have a slight advantage over Leicestershire after the second day of their County Championship Division 2 clash at Arundel Castle. The hosts conceded a first-innings deficit of 19 after bowling out Leicestershire for 281 but they got through 20 overs before stumps losing only one wicket. Chris Nash (21) was leg before to Clint McKay but Luke Wells and Harry Finch took their side to 74-1 stumps, a lead of 55. And with two spinners in their team on a pitch already showing signs of wear, Sussex will fancy their chances of claiming a third win in four games if they can chisel out a lead of 250 or more. Earlier events had followed a similar pattern to the first day with plenty of Leicestershire batsmen getting set without anyone going on to play the decisive innings that would have put them in control. No batsman has yet to make a 50, although Wells, who has played well so far for his 39, will fancy his chances on the third day. Slow left-armer Danny Briggs (1 for 49) and leg-spinner Will Beer (2 for 53) bowled 39 overs between them. There was some rough to exploit, particularly for Briggs who had Mark Cosgrove, Leicestershire’s left-handed captain, in all sorts of trouble during the best passage of play. Cosgrove (40) was dropped twice on 27 and survived a loud appeal for a catch at the wicket before eventually pushing forward and getting a thin edge to a ball which turned just enough. Beer snared debutant Will Fazakerley padding up to a googly for a second-ball duck before ending the innings when he bowled Richard Jones for six. But Leicestershire’s last two wickets had added 55, which might turn out to be crucial, while Lewis Hill’s nuggetty 49 held their middle and lower order together at times when it looked as if Sussex were about to take control. Chris Jordan and Jofra Archer both bowled 24 overs, a commendable effort in the pitiless heat, and each took two more wickets. Archer, who took 11 wickets when the sides met at Grace Road last month, ended a stand of 70 between Cosgrove and Colin Ackermann for the third wicket when Ackermann (40) gloved one down the leg side. He then returned after lunch to bowl Ned Eckersley through the gate for 35 after he had put on 50 either side of lunch with Hill. Jordan eventually induced Hill to drive to cover for 49, made in a shade under two hours, and two balls later had Matt Pillans held at second slip while Abi Sakande bowled Rob Sayer through the gate for 31. 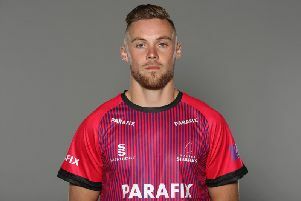 That left the Foxes on 226 for 8 but McKay chanced his arm to make an unbeaten 32 with five fours that gave them a small first-innings advantage.